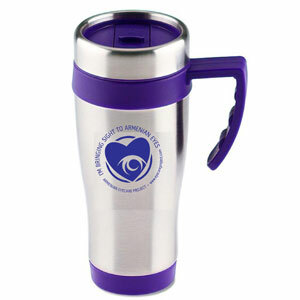 Take your drink to-go inside this double-wall stainless steel tumbler. The plastic liner and stainless steel outer wall helps prevent your beverages from losing heat. While you’re moving, the screw-on lid with slide-lock opening helps contain spills. Blue accent color pops brightly against the silvertone travel mug. Included finger-grip handle helps keep your drink steady in your hand.